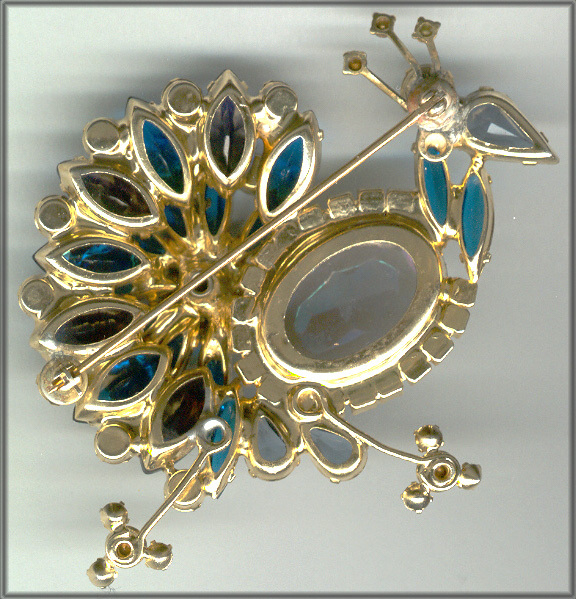 Large brooch and earrings with a/b's and unfoiled stones. 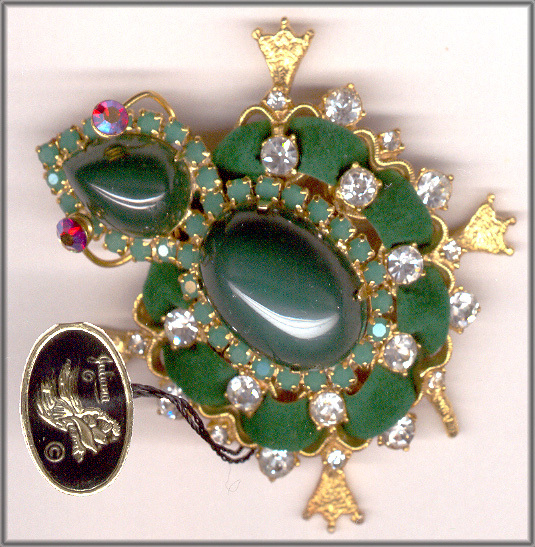 The brooch measures 3 1/4" by 1 1/2" and the earrings are 1 1/2" by 1". [larger view] [back view] Courtesy of Clerestorial. 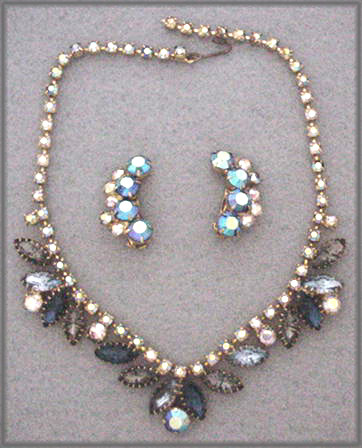 Bracelet and earrings in rectangular and round topaz colored stones and aurora borealis round stones in 2 sizes. 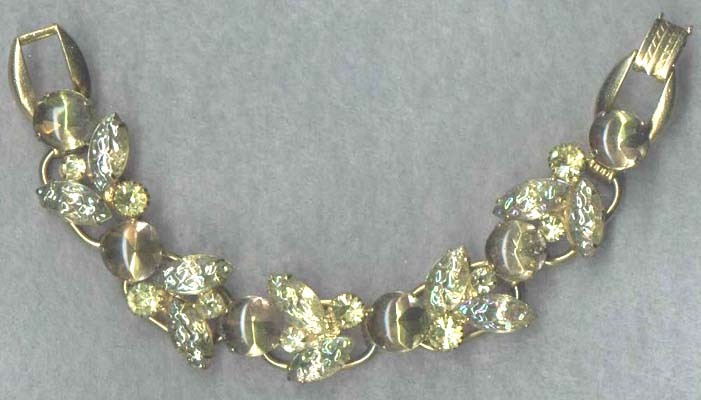 The center round stones measure 5/8" across. 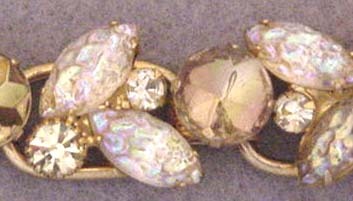 The bracelet is 7 1/2" long and 1 1/8" wide. 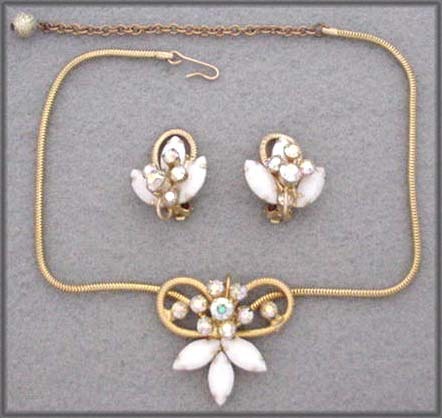 The earrings are over 1" wide and 1 3/8" high. [larger view] [back view] Courtesy of Clerestorial. 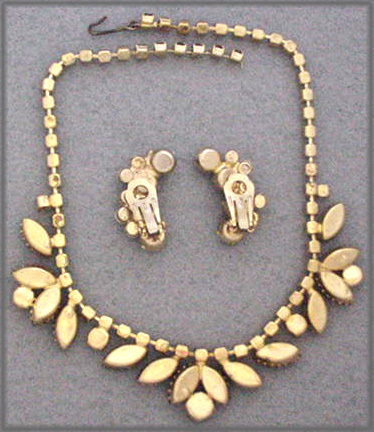 Earrings and 5 link bracelet. 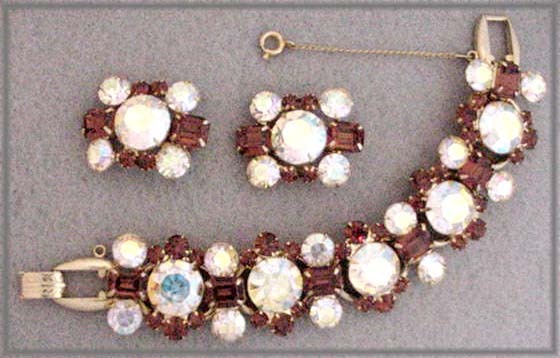 Round topaz rhinestones in 2 sizes, skinny black navettes and medium gray round rhine-stones form the base of the bracelet. Black faceted round beads, green balls with some aurora borealis coating and faceted topaz crystals with some a/b coating dangle off the top of the bracelet. 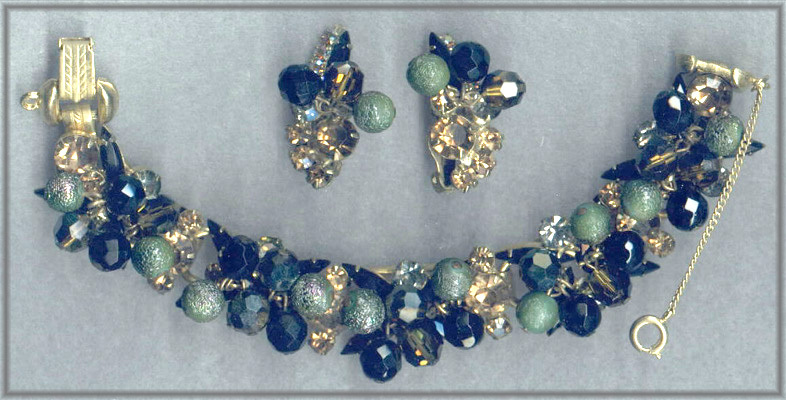 The earrings have the same components plus 4 small a/b coated stones lining the black navette. [larger view] [back view] Courtesy of Cleres-torial. 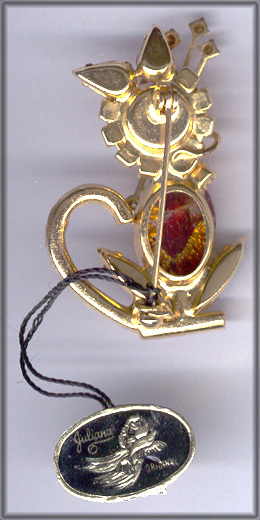 Pendant measures 2" by 1 3/8". 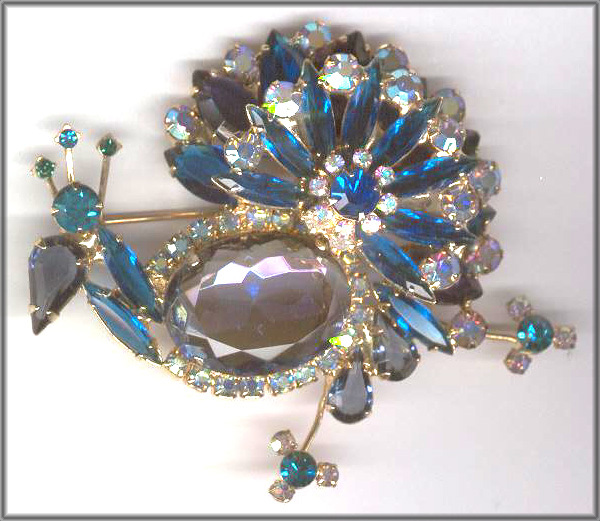 It has a large (3/4" long) topaz colored stone in it's center which is surrounded by round topaz colored rhine-stones. 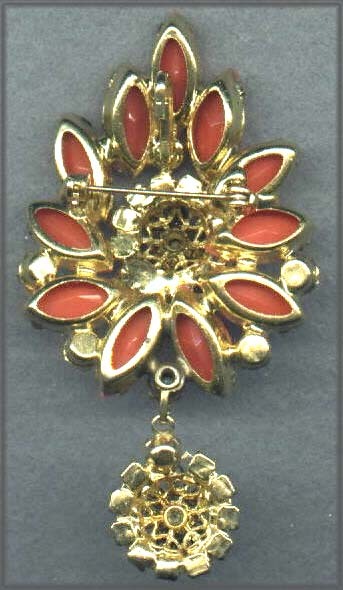 The outer ring consists of watermelon rivoli rhine-stones. Please view all of the photos as the rivolis were almost impossible to capture. [larger view] [larger view] [larger view] [back view]. Courtesy of Clerestorial. 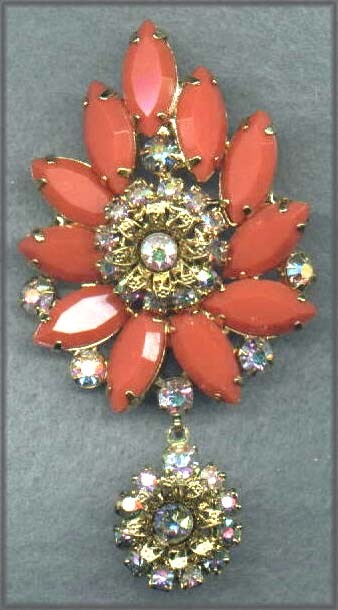 Brooch/pendant with coral faceted marquis stones and bright aurora borealis coated rhinestones. It is 2 7/8" in length and 1 5/8" wide. [larger view] [back view] Courtesy of Clerestorial. 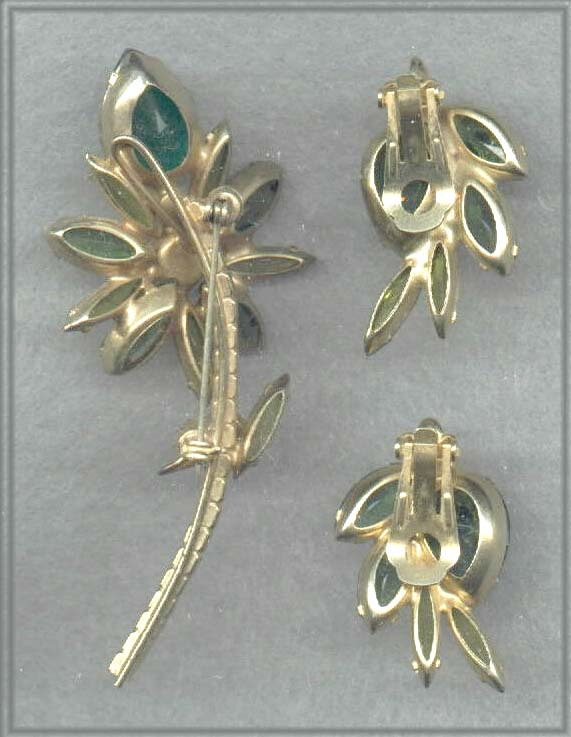 Bracelet with round cabo-chons, 2 sizes of round prong set r/s and molded glass leaves with aurora borealis coating. 7 1/2" long by 3/4" wide. [larger view] [back view] [close up] Courtesy of Clerestorial. 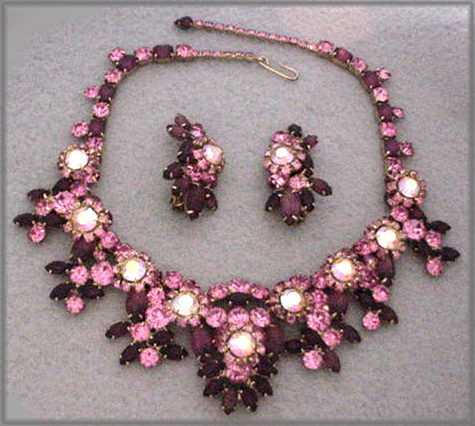 This necklace and earrings is too die for! All of the pink rhinestones are bight and clear. The largest pink stones have an aurora borealis coating to them. The amethyst navettes have a satin finish to them. 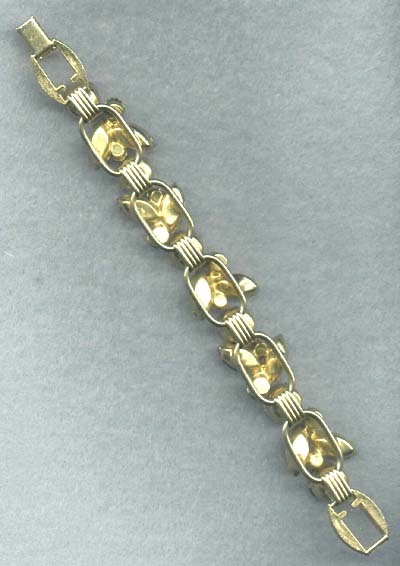 The necklace is 16" long with 2" of adjustability (14-16") The larger center area is a 1 3/4" drop. 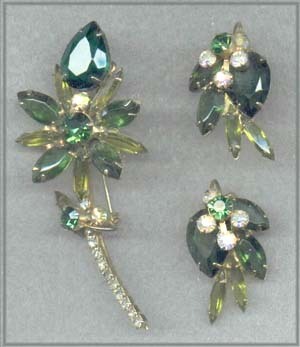 The earrings are 1 7/8" high and 1" wide. [larger view] [close up] [back view] Courtesy of Clerestorial. 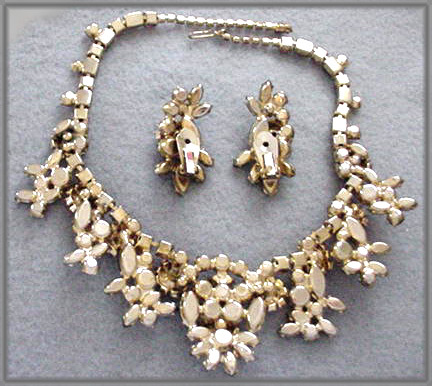 Necklace and earring set. 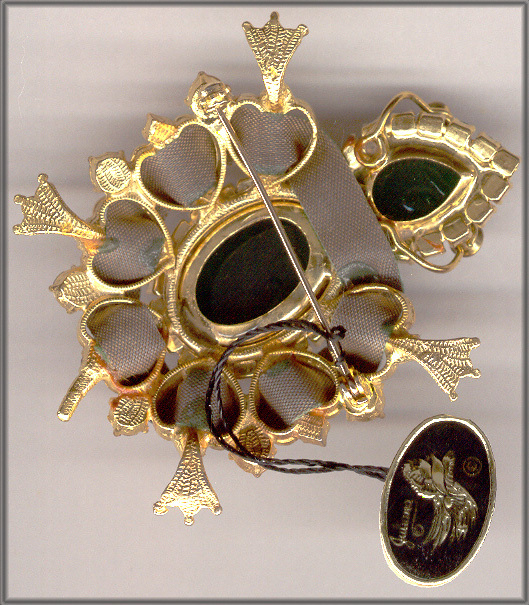 The necklace is 15" long and 1" wide in the middle. The earrings are 1 1/4" high and about 1/2" wide. 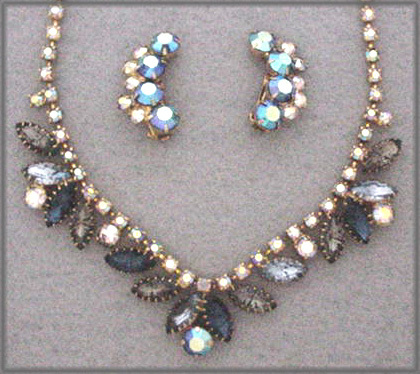 The colors in the necklace are aurora borealis round rhinestones, faceted navettes in Montana blue, light blue and gray and heavily a/b coated stones. [larger view] [close up] [back view] Courtesy of Clerestorial. 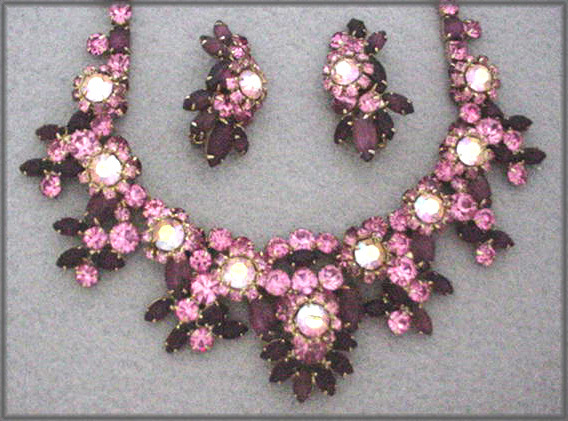 Necklace and earring set. The necklace is 16 1/4" long with 3 1/2" being the extender. The center drop is 1 1/2". 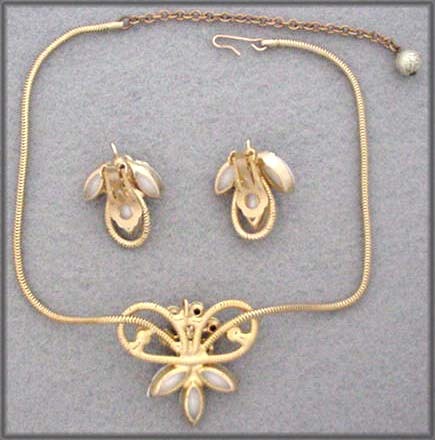 The earrings are 1" by 1". [larger view] [back view] Courtesy of Clerestorial.